Now that President Obama has nominated Solicitor General Elena Kagan to replace Justice John Paul Stevens on the U.S. Supreme Court, the Senate must provide its advice and consent. It is essential that the Senate perform this Constitutional duty in a thorough manner and give Ms. Kagan’s record a full and fair review. There is no doubt that Ms. Kagan possesses a first-rate intellect, but she is a surprising choice from a president who has emphasized the importance of understanding "how the world works and how ordinary people live." Ms. Kagan has spent her entire professional career in Harvard Square, Hyde Park, and the DC Beltway. These are not places where one learns "how ordinary people live." 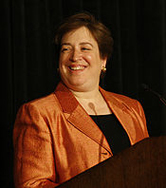 Ms. Kagan is likewise a surprising choice because she lacks judicial experience. Most Americans believe that prior judicial experience is a necessary credential for a Supreme Court Justice. If confirmed as a life-tenured justice, Ms. Kagan’s rulings could affect the life, liberty, and property of Americans for generations. So we must learn completely about her judicial philosophy and commitment to our founding principles. And we must ensure that she rejects judicial activism and holds fast to the belief that justice is blind. Ms. Kagan failed to answer many questions posed by senators prior to her confirmation as solicitor general. This failure led many members to oppose her nomination. I hope that she will now more willingly respond to reasonable and relevant questions. America deserves a nominee who reveres the law and applies it impartially. Through the confirmation process, I look forward to determining whether Ms. Kagan meets this high standard and is fit to serve as an associate justice. If she has never actually rendered a judicial decision in her life, other than perhaps in a mock trial at Harvard, by what measure do we access her ability to do so impartially? Well, we know that she passed judgment on the military recruiting on the Harvard campus, but that was hardly an impartial decision. That was more like a royal decree based on personal preference and bias than a legal opinion and a fair hearing of facts.